A Spirit White Cleaner for all white leathers. Leather footwear, bags and clothing. To condition and shine use Waproo White Renovating Polish. Remove dirt from shoes with damp cloth. Shake bottle. Apply dressing evenly with a cloth and rub in well using circular and gentle strokes. Allow to dry thoroughly. Buff gently with soft cloth to desired lustre. 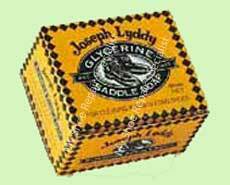 Glycerine Soap is made up of a high glycerine content to soften, clean and nourish leather. Ideal for cleaning smooth leather. Skin shampoo for dogs, cats and horses. Renovates saddles and gear. Apply with a soft damp cloth. Rub gently to develop lather and remove dirt. Avoid hard rubbing, but wipe all the surface. Rinse cloth and wipe down. When dry, polish with a clean cloth. For suede / nubuck use a brush to bring up the pile. For those high shine business, dress shoes and boots. A spirit based formula with a high black dye additive to clean, recolour, renovate and buff to a brilliant high shine. Cleans, conditions and deodourises athletic footwear of all colours. Ideal for canvas, nylon, smooth leather and vinyl. Spray Aerosol onto area and apply a soft damp cloth rubbing gently to develop lather and remove dirt. Avoid hard rubbing, but wipe all the surface. Remove surface dust with soft cloth. Shake bottle. Rub Dressing into Patent leather. After 10 minutes polish with soft cloth. Apply to new shoes before use. Test in an inconspicuous place first. Shu-Glo is a cleaning and conditioning compound for all coloured leather, patent or plastic shoes,handbags, etc. Shu-Glo removes marks and stains and leaves a shiny surface, water-repellent, stain resisting surface. Shu-Glo increases the suppleness and the life of the leather. Leaves no powdery deposit. Shu-Glo Is not suitable for suede or aniline dyed leather. Squeeze a liberal amount onto a damp cloth or a brush, rub vigorously until all marks have disappeared, then buff with dry cloth. To remove grease marks, spots and stains from leather, satin and fabrics, shoes, hats, gloves and bags. Can be used on leather, satin and fabrics. Use a soft cloth, test in a small area first, let dry. Then apply to rest of area. Blend of strong deglazing solvents for use on genuine leather. 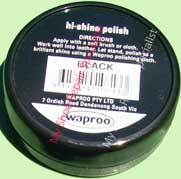 Removes accumulated polish to strip leather clean prior to redyeing or recolouring. Wet an area of cloth and gently rubb onto leather surface removing the shine and any polish or dirt from the surface. For best results scrumple small peices of paper into a ball and stuff hard into any holes that are not being painted, tape any edges not being painted and then apply spray or dye. A gentle cleaner to remove grime and soil from all suede and nubuck. Apply shampoo and gently rub with a brush to remove any stains and dirt. Enhances, revives, conditions, protects and recolours suede and nubuck footwear, jackets etc. Nourishes, conditions, refreshes faded colours. Fast and easy to apply. Shake the plastic bottle well. Press the sponge onto the shoe. Apply evenly, leave to dry. class="style57">Leather expander for tight shoes. A penetrant that conditions leather fibres allowing expansion in localised areas. Not for use on suede or unfinished leathers. Spray on the inside and the outside of your shoes, wear shoes while spray is damp. If irritation occurs stop wearing shoes, do not use spray. Spray on a test area before applying on outside of shoe. Cleans and conditions all types of smooth leather and synthetic material. A Superior leather conditioner with a rich blend of natural waxes and lanolin. Protects, cleans, polishes and preserves smooth leather. It is a solvent suitalbe for cleaning and removing oil or dirt or to strip leather clean prior to redyeing or recolouring. Wet an area of cloth and gently rub onto leather surface removing the shine and any polish or dirt from the surface. For best results scrumple small pieces of paper into a ball and stuff hard into any holes that are not being painted, tape any edges not being painted and then apply spray or dye. 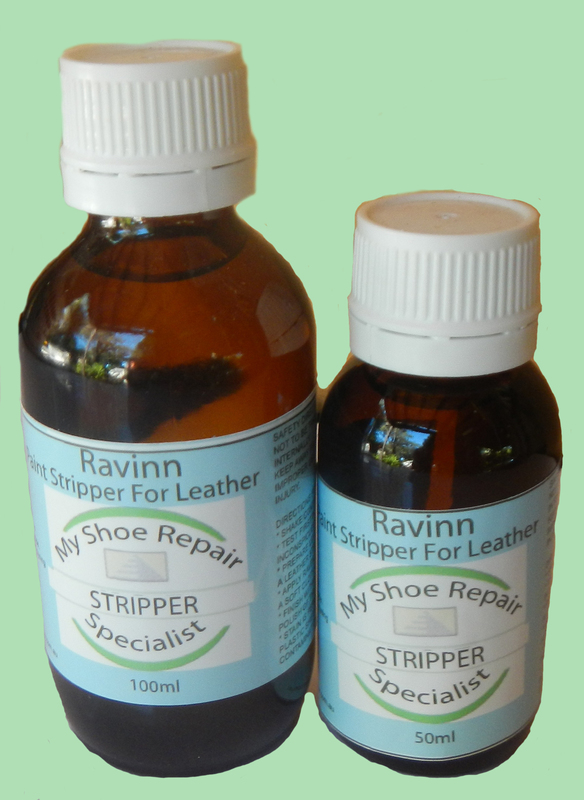 Waproo Stripper and Ravinn leather stripper is used in preparing leather for painting . For synthetics, Waproo preparer is to be used in preparation . Waproo Cosmic White, Waproo Spot Stain Remover and Waproo Suede and Nubuck Fabric Shampoo are good for removing dirt or stains.